← Suffering the Flu? Be Happy It Isn’t the Plague! The stadium is hot, packed with roaring fans ready to cheer for their favorite players. Above the din, vendors are screaming out what foods and souvenirs are for sale. The city is festooned with colorful advertisements sporting muscle-bound celebrities endorsing the latest products. Super Bowl 2013? Think again. It’s actually ancient Rome. As the doors open, the gladiators emerge, boldly strutting onto the field for the day’s games. The crowd goes wild, Roman BCE-style. Today, our football players are celebrities. They tell us what to eat, what to wear, which cell phone to buy and even which cable provider to use. They have their own action figures, scores of fans and high-powered agents to make sure they’re making the most money. It was no different throughout the Roman Empire. They had the gladiators—and they were superstars. The teams were the ludi, or gladiatorial schools, each run by a lanista, who owned the ludi and the gladiators. Most gladiators were slaves, prisoners of war or criminals with little to lose and much to gain—fame, money and freedom—if they excelled in their sport. The lanistas acted as agents and made money only when their gladiators were winning, so it was important to scout out the most promising athletes, train them with topnotch trainers (usually former gladiators), feed them well—including specially prepared muscle drinks– and make sure they were well-loved by the fans and the aristocracy to bring in plenty of denarii (coinage). Contrary to popular wisdom, the thumbs up or thumbs down practice wasn’t used as much as has been portrayed. Most gladiators survived unless wounded in battle. The investment in gladiators was not taken lightly, and like today, the games generated big business for the local economy. So without ESPN or Sports Illustrated, how did you keep up with the news of your favorite gladiator or which olive oil he was endorsing? There were a couple of options. First, check the walls of the city. 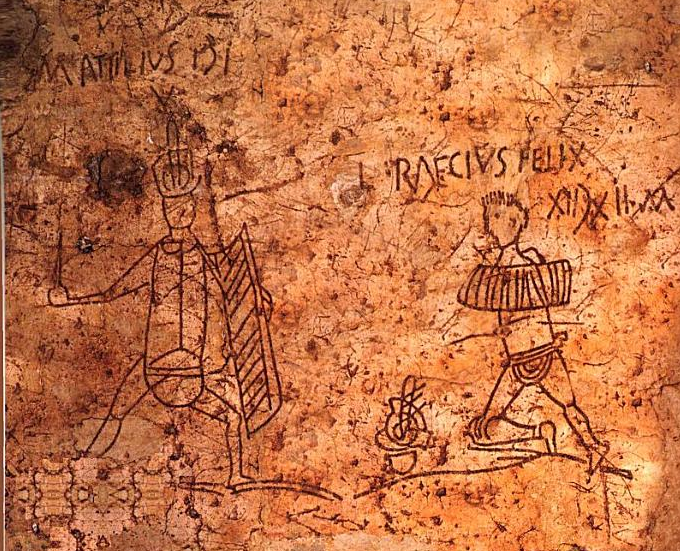 Much like today’s giant billboards, graffiti were drawn as sponsored ads for products and mosaics depicting fights between famous gladiators boosted popularity for the sport. Numerous wall inscriptions from Pompeii give us a view into the celebrity-status of these men and the fact that they were a vital part of Romans’ daily lives. 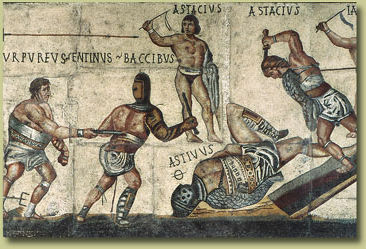 For example, one wall advertises “Twenty pairs of gladiators provided by Quintus Monnius Rufus are to fight at Nola May First, Second, and Third, and there will be a hunt,” while another depicts a winner standing over his defeated opponent (Figure 1). Just like today’s super-fans such as the 49ers’ “Faithfuls” or the Packers’ “Cheeseheads,” hero worship thrived in Roman times. In fact, you could get your very own gladiator action figure. 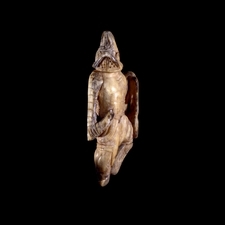 Tiny figurines of bone or ivory have been found complete with armor and weapons; you can just picture Roman children sitting on the floor playing “gladiator” (Figure 2). So this Sunday when you’re parked in front of your big screen TV surrounded by friends and food rooting for your team and watching the famous Super Bowl commercials, consider mentioning that ancient gladiators hawked olive oil, had endorsement deals and were miniaturized as their own action figures. We really aren’t as far away from the ancient past as we think. 1. Ewigleben, Cornelia, Jackson, Ralph, and Eckart Köhne. Gladiators and Caesars: The Power of Spectacle in Ancient Rome. University of California Press, 2000. 2. Cyrino, Monica. “Gladiator and Contemporary American Society”. Gladiator: Film and History. Ed. Martin M. Winkler. Blackwell, 2004. 4. Cowell, Frank Richard. Life in Ancient Rome. New York: Penguin, 1976. This entry was posted in Blog, Celebrities, Public Life, Sports and tagged ancient history, AntiquityNOW, gladiators, history, Pompeii, Rome, Super Bowl. Bookmark the permalink.